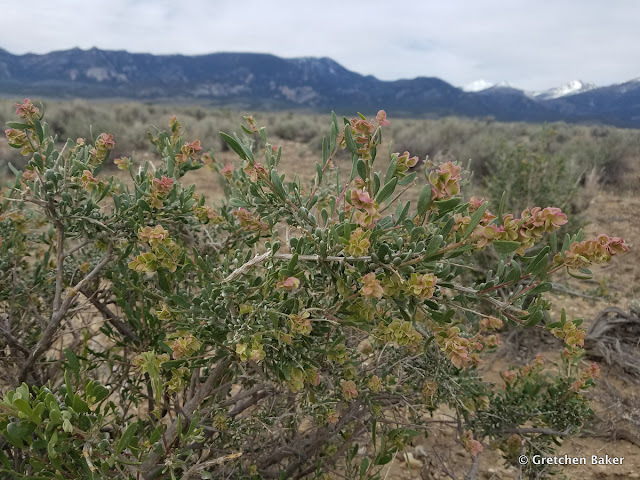 The Sagebrush Discovery Trail is a connection of two-track roads along ditches on the west side of Baker, Nevada. 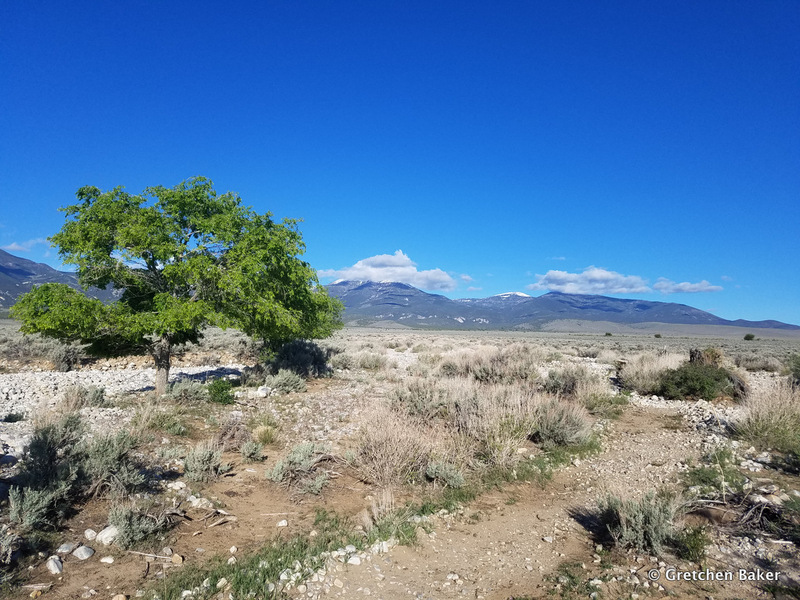 The Snake Valley Trails Partnership is working to improve the very rocky roads to make them more suitable for biking and walking. Right now you can take a jarring mountain bike ride or hike over loose rocks, but hopefully someday in the not-too-distant future you'll be able to push a stroller or have a kid ride a bike or an elderly person stroll along and not worry about tripping. 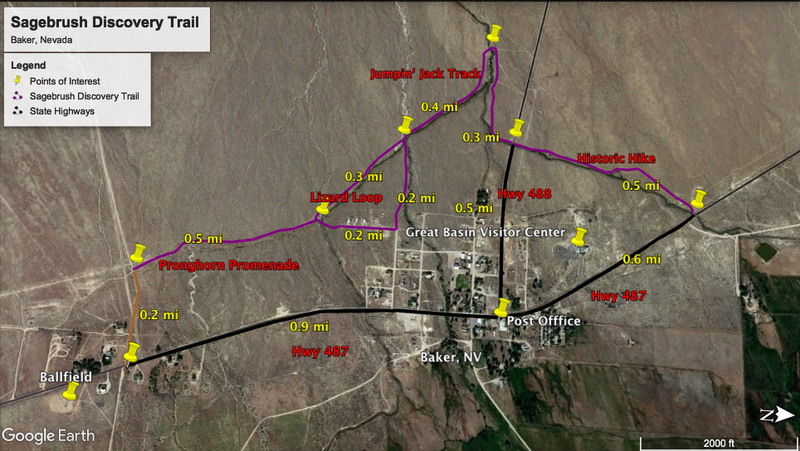 On the map above, the purple line is the Sagebrush Discovery Trail, divided into several sections. 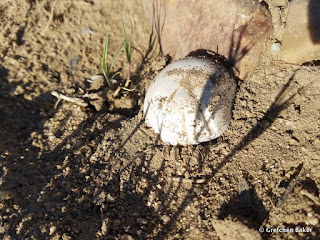 I often do trail runs on this trail, and if I have my phone with me, I stop and take photos of interesting sights. Since it's spring/early summer, one of those main things is flowers! 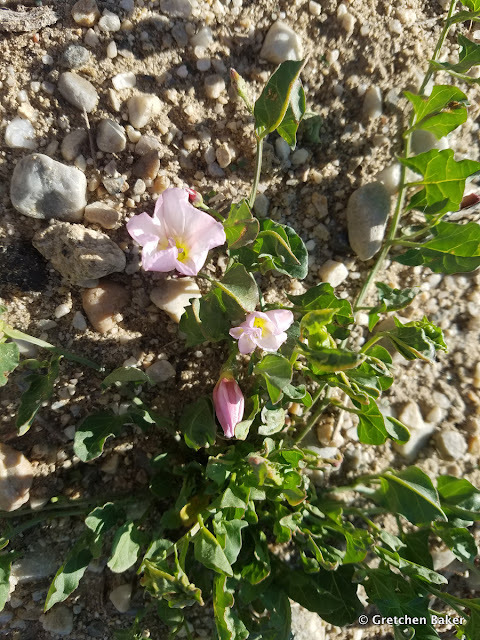 In March, I saw my first flower. For this and all the following identifications, I did my best, but am not 100% sure I'm right. If you know your plants and see a mistake, please let me know so I can learn! It's not very large or colorful, but it is a flower! 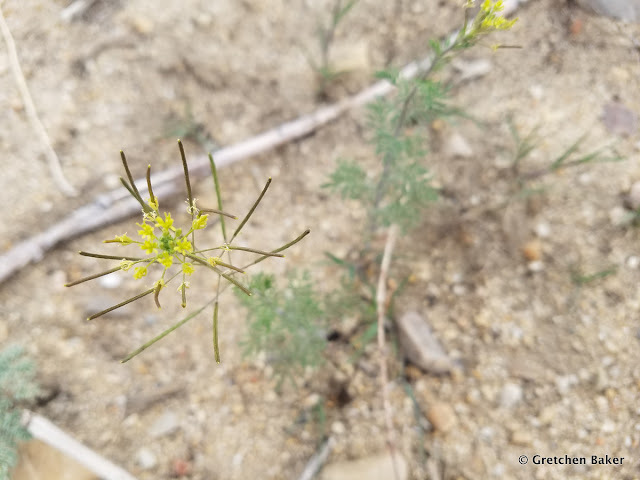 This little bit of joy is Ibapah spring parsley (Cymopterus longipes var. ibapensis). 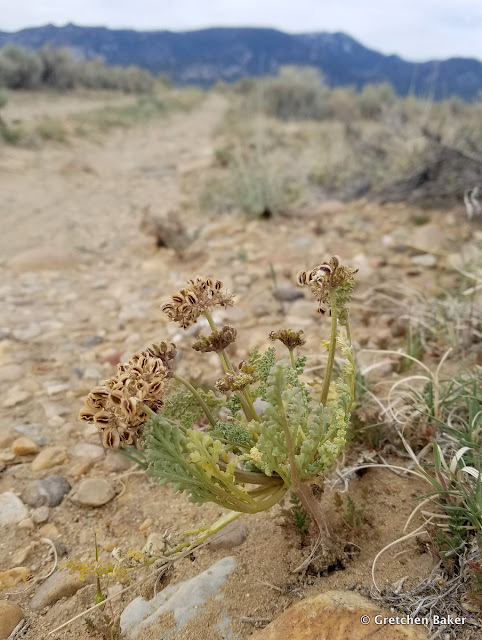 Something similar, but with a little longer and flatter leaves is wide-winged spring parsley (Cymopterus purpurascens), which is a frequent early plant below 9,100 feet. 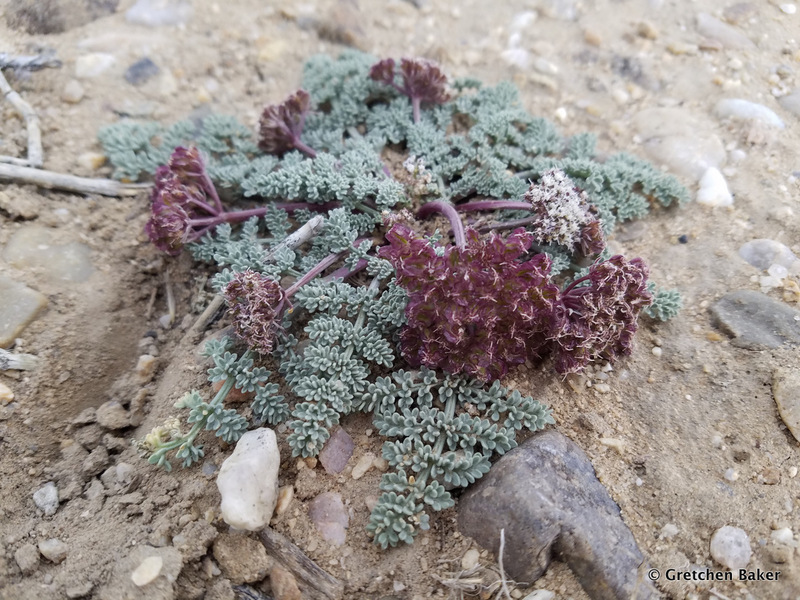 It doesn't take long for the Ibapah spring parsley to go to seed, with purple seed pods. 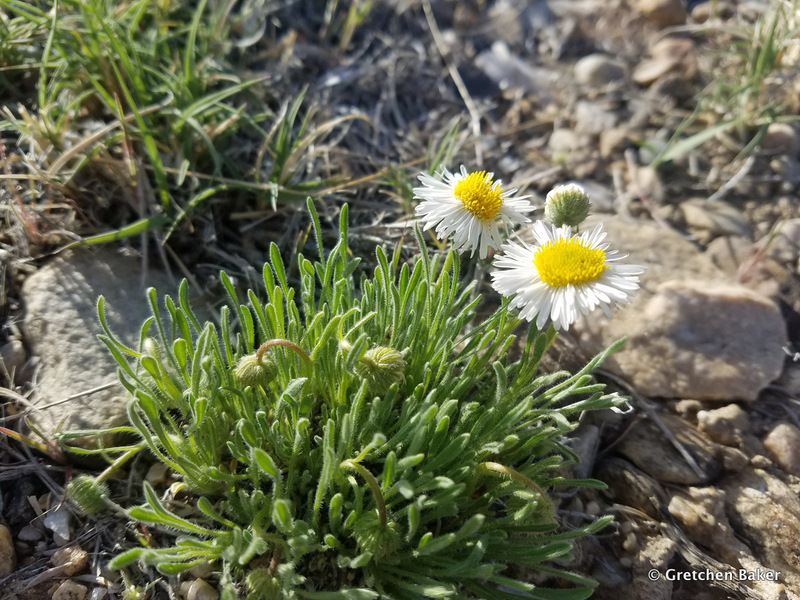 These tiny erigeron pop up in just one place along the trail. They are compact fleabane (Erigeron compactus) and are still blooming a month after I first saw them. 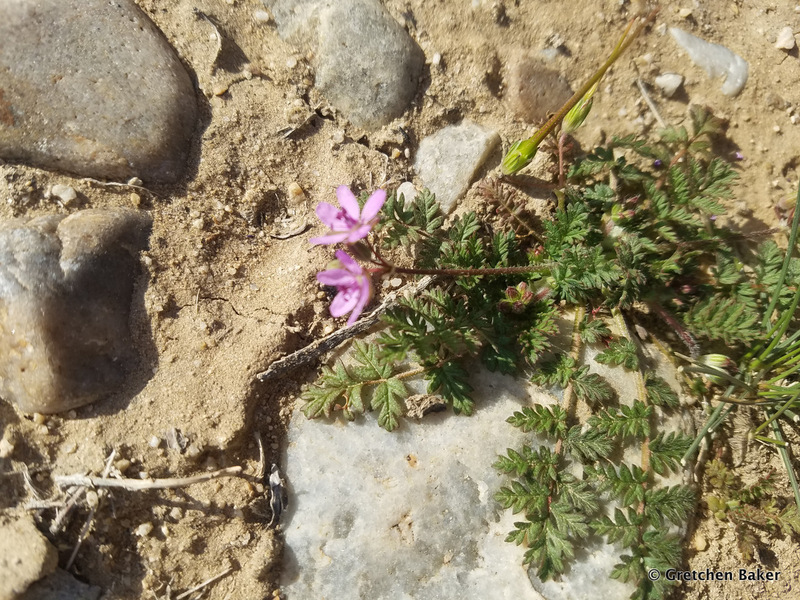 This non-native red-stemmed filaree or common stork's bill (Erodium cicutarium) is much more common. 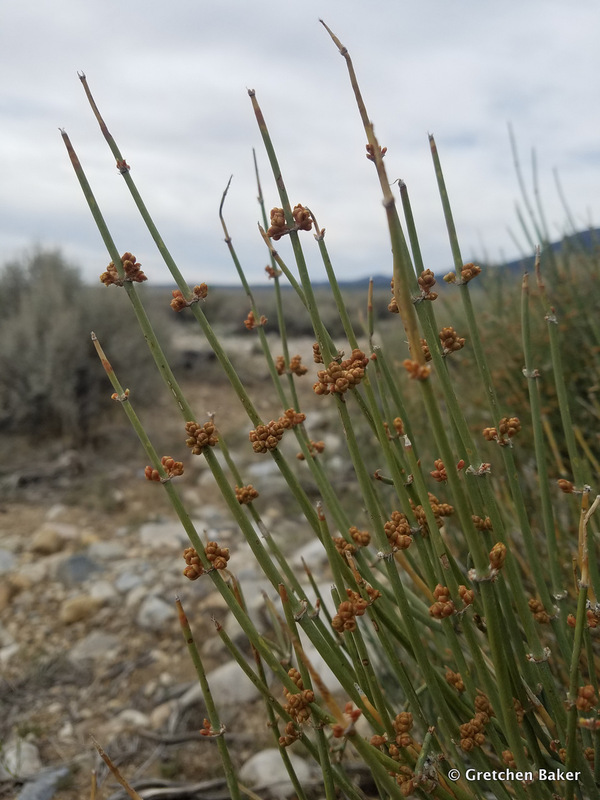 The seed pods look like little swords, and the kids like to pick them and pretend to sword fight. This plant is the geranium family. 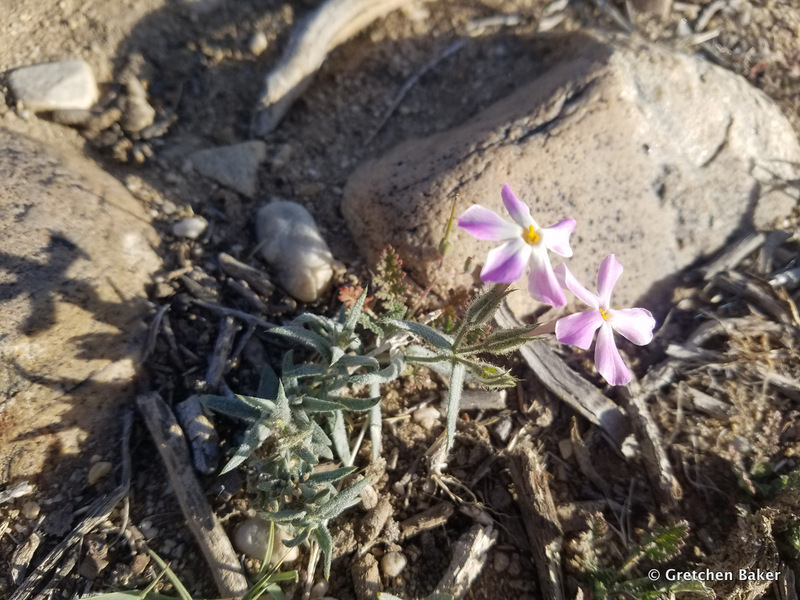 Variable Phlox (Phlox longifolia) decorates a few places, but the flowers don't last long. 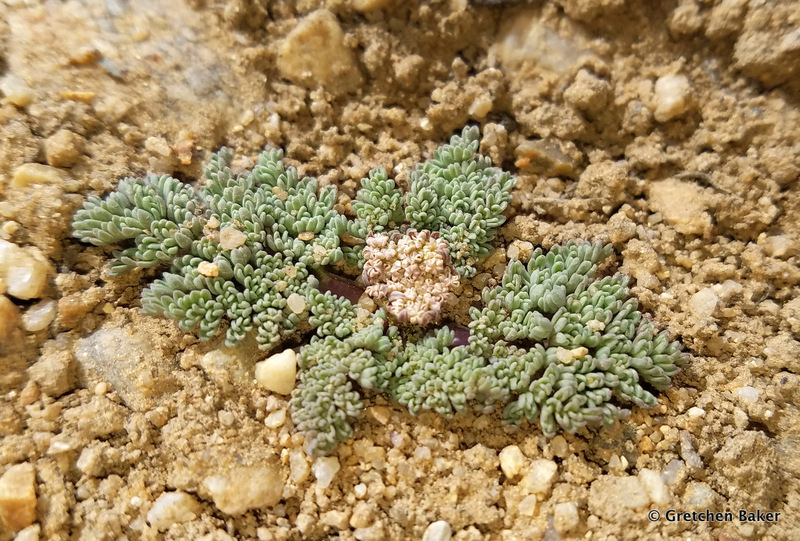 This tansy mustard (Descurania sp.) 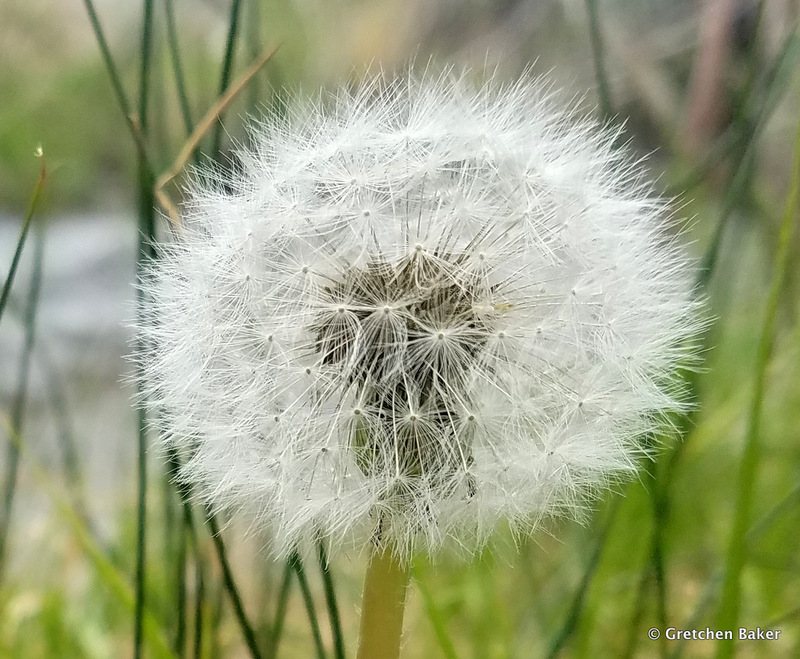 goes to seed fast. I bet you know this one! 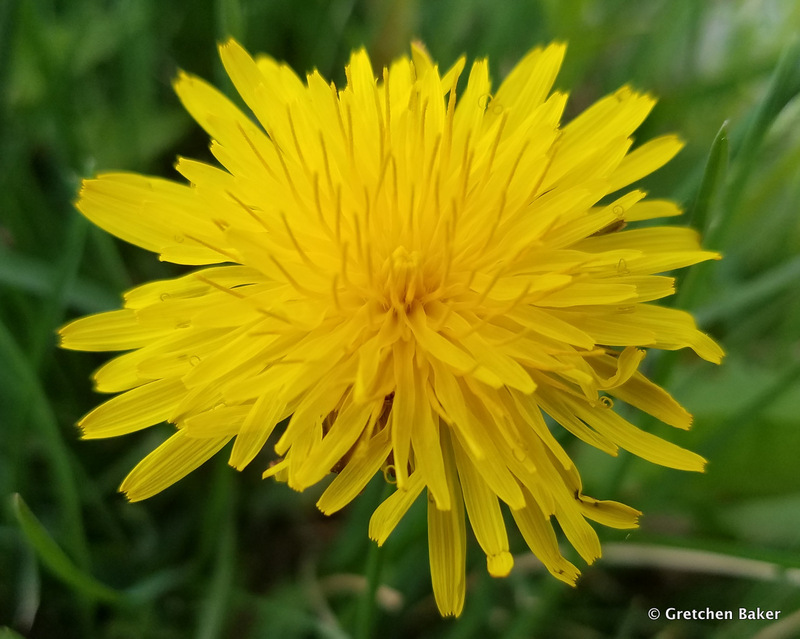 Good old common dandelion (Taraxacum officinale). It is so pretty. And although it's non-native, the leaves are edible. There are a number of shrubs along the way, including spiny hopsage (Grayia spinosa). The bush gets a beautiful pink glow to it when it's in bloom. 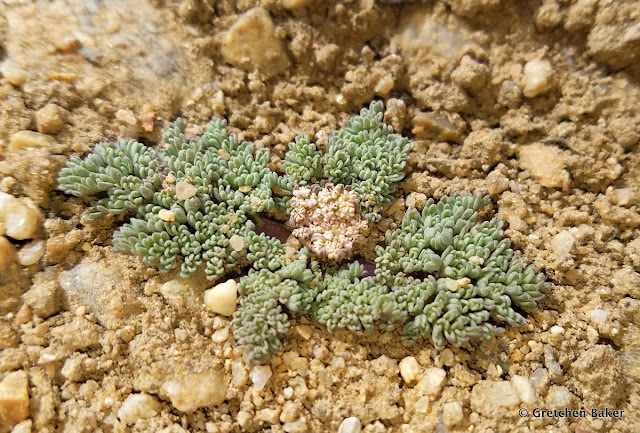 Check out how this spring parsley has pushed so far out of the ground. I've seen it move small rocks as it grows. 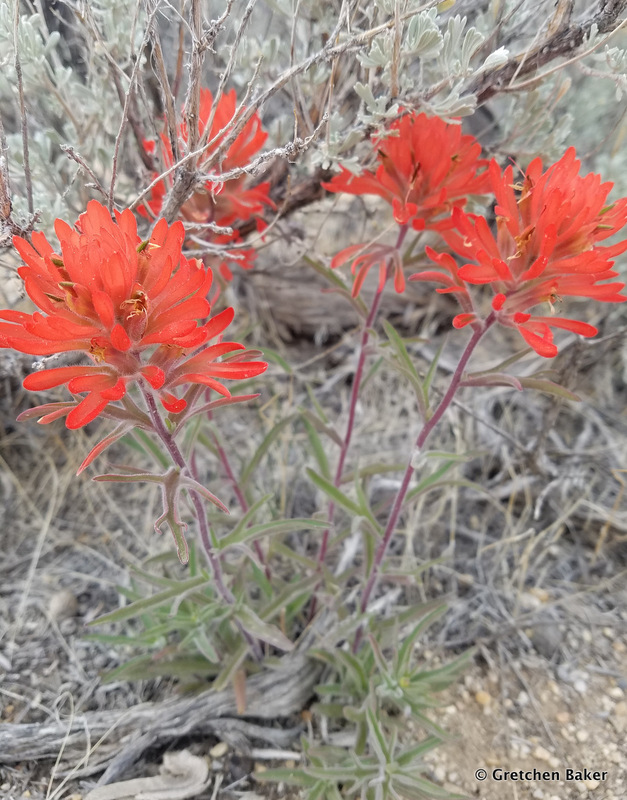 Indian paintbrush (Castilleja chromosa) is easy to spot. 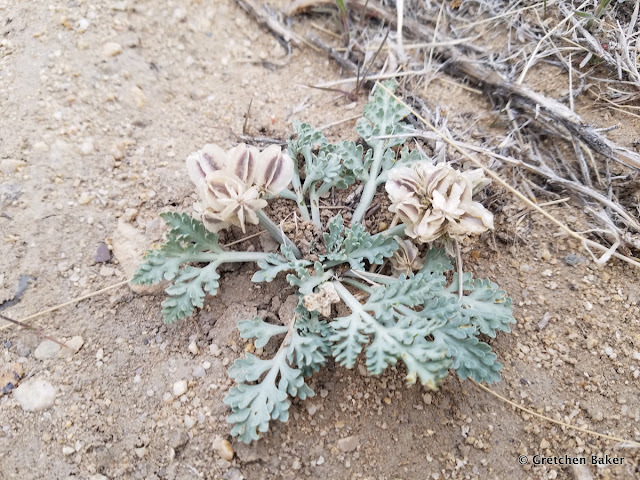 It often grows next to sagebrush. 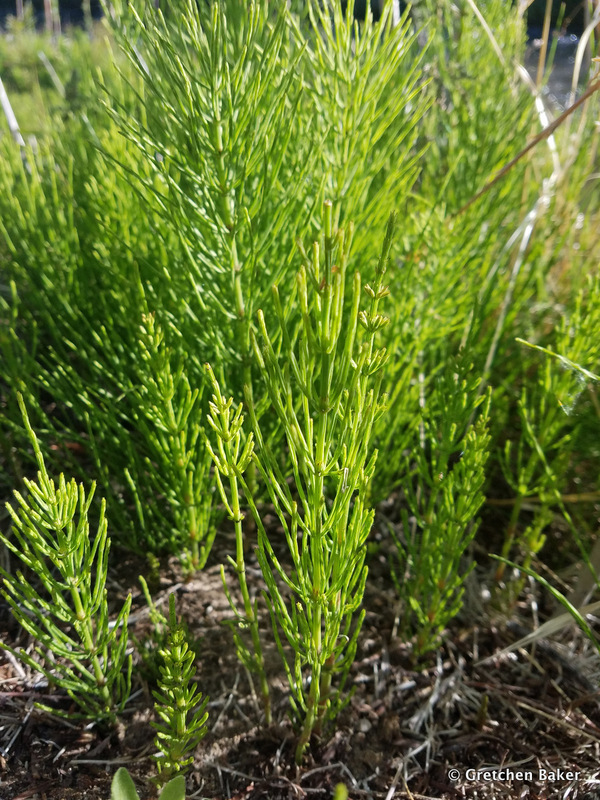 Mormon tea or green ephedra (Ephedra viridis) is a distinctive-looking bush. 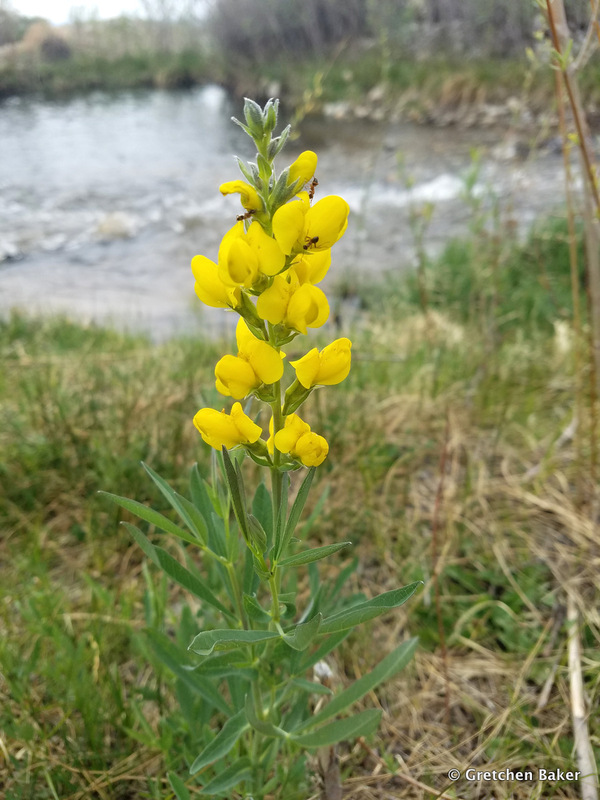 I was so excited to see this flower. I only saw two clusters. This is showy Townsend daisy (Townsendia floriflora). 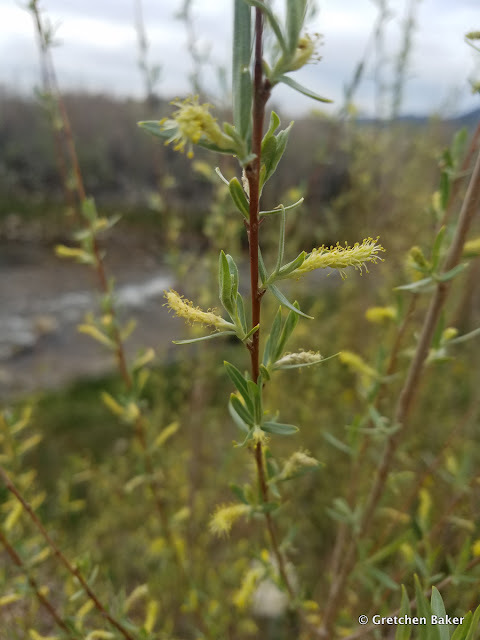 Willow (Salix exigua) grows along many of the ditches. Yellow pea (Thermopsis rhombifolia) is easy to spot. And apparently ants like it. 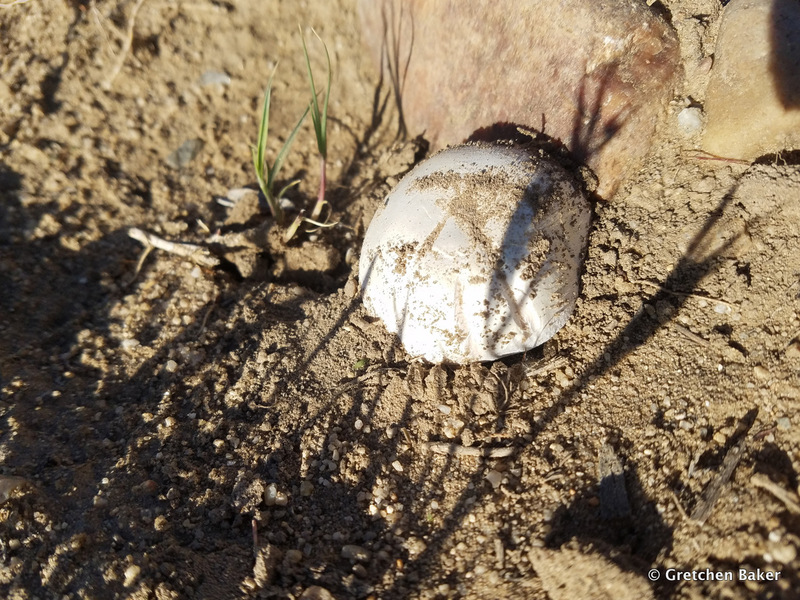 After nearly a week of rain, I went back out on the trail and found a mushroom! Wow, so unexpected. Also, these beautiful asters (Aster species). Equisetum or field horsetail (Equisetum arvense) grows right next to the creek. It's such a primitive-looking plant that makes me think of dinosaurs. The Indian ricegrass (Oryzopsis hymenoides) has little seeds. 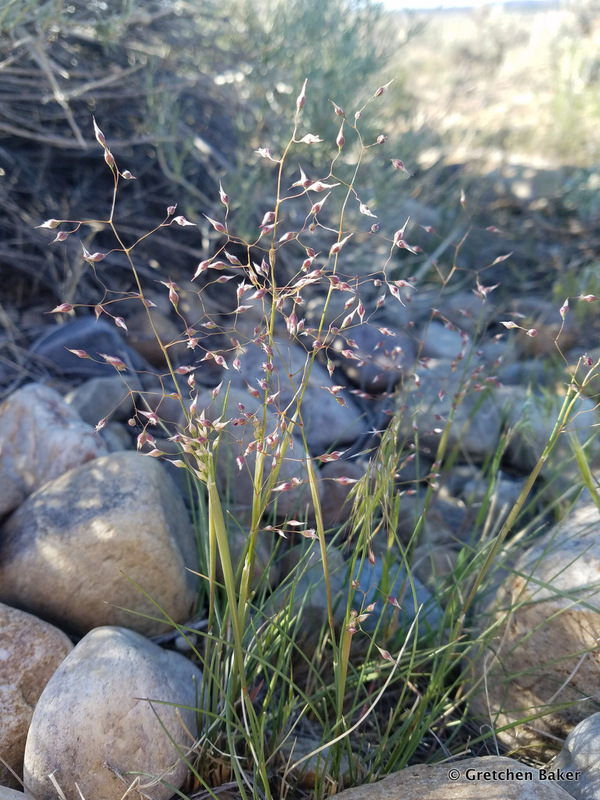 It's a perennial bunchgrass, and as the name suggests, was used by the Indians. 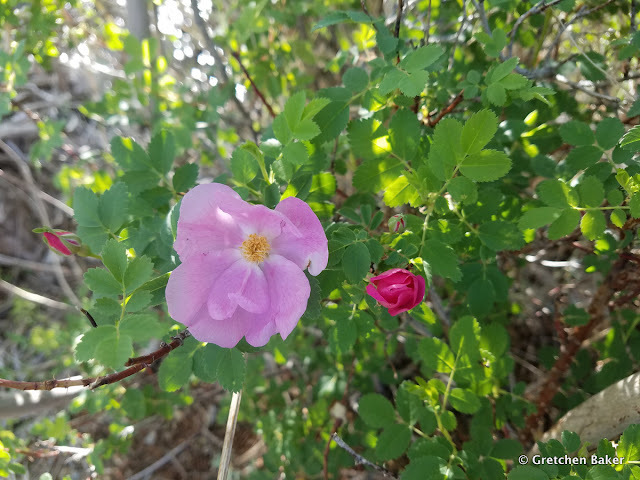 Woods' rose (Rosa woodsii) is the only native wild rose in the area, so it's easy to identify. And it smells so good! Just watch out for those thorns. Morning glory (Convulvulus arvensis) is a non-native plant that drives me crazy in my garden. It apparently also grows when there's less moisture. 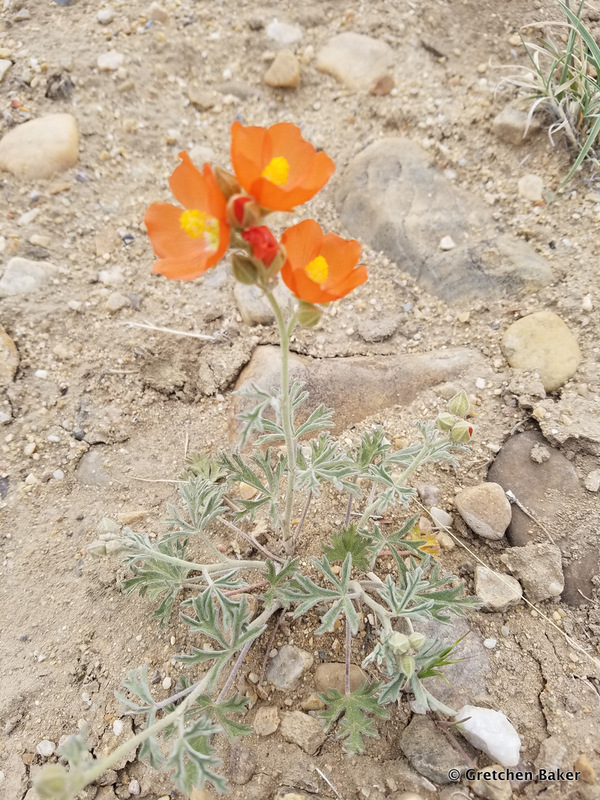 The bright orange globemallow (Sphaeralcea grossulariifolia) always makes me smile. We don't have many orange flowers, so this one is easy to identify. It occasionally blooms later in the summer if we get a lot of rain. 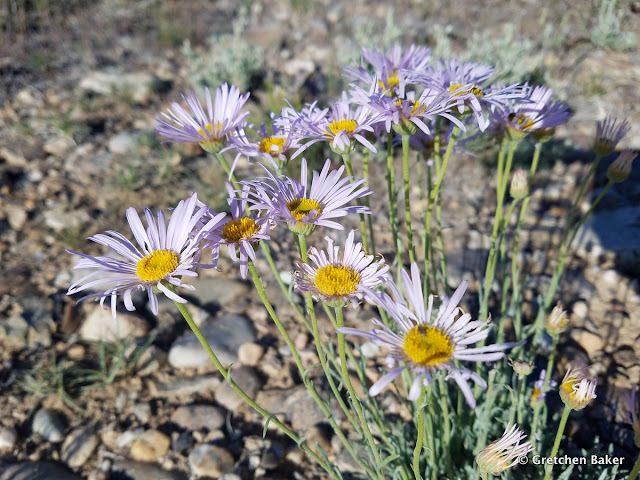 Ready to get out and see some of these flowers for yourself? The trail is on the primitive side, but it's beautiful! We had fun with A's wildflower project for school--which you in fact helped us with. She found and identified (not so easily, actually with the book she needed to use) the storksbill. Everyone loved the looks of that plant. 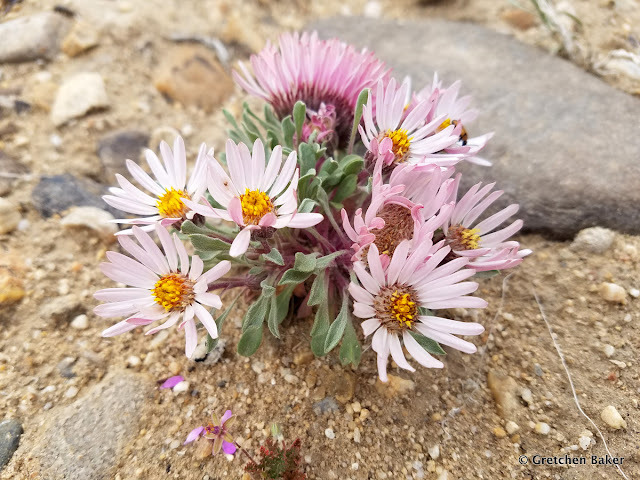 Interesting to see it has such a huge range and grows in Nevada as well as Maryland.